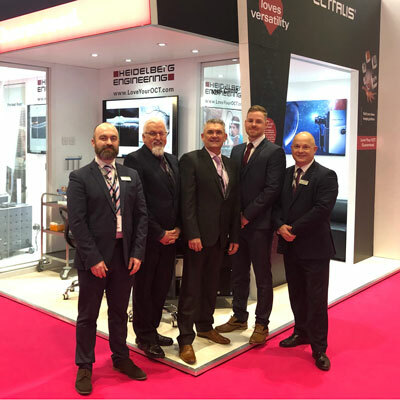 Heidelberg Engineering wins "best exhibition stand" at 100% Optical | Heidelberg Engineering Ltd.
Heidelberg Engineering had a successful 100% Optical 2019 with the award of “best exhibition stand” in the equipment section. “The exhibition stand was designed to show the versatility of the SPECTRALIS imaging platform with themed rooms representing the device being used in the hospital, high street and even outer space setting, which is a nod to the SPECTRALIS that is located on the International Space Station”, explains Emily Malbon, Marketing Manager, Heidelberg Engineering. “The stand also showcased our ‘Love Your OCT Guarantee’, which is a scheme that allows optometrists to hand their SPECTRALIS back to us after 18 months if they are not completely satisfied. The Love Your OCT Guarantee reflects how confident we are that our customers will love their OCT and gives them peace of mind about their purchase”. Visitors of the show also enjoyed the Heidelberg Engineering Academy educational programme, which was fully booked. Dr. Andrew Tatham, Consultant Ophthalmologist, Princess Alexandra Eye Pavilion, presented a lecture on using OCT to manage glaucoma patients. Many attendees went on to purchase a Glaucoma Imaging Atlas textbook, which is a new comprehensive diagnostic guide for glaucoma assessment and management featuring 29 contributors from 5 countries and 30 detailed patient case studies. There was standing room only at the OCT LIVE retinal disease workshop, presented by Tim Cole, Clinical Market Development Manager, Heidelberg Engineering, where a real patient was scanned live in HD using the SPECTRALIS. “The OCT LIVE format is fascinating and always draws a crowd”, says Tim. “We are able to demonstrate OCT image acquisition on the projector screen and showed how to identify and evaluate the patients’ diabetic retinopathy”.